It’s been my experience that when bacteria are discussed, it is usually in a negative light. This is despite the fact that there are ten times more bacterial cells in and on our bodies than human cells, and the co-location is actually mutually beneficial. Understandably, viruses get the same treatment, but with their potential sequestering for genetic therapies perhaps there will be a change. I have actually been thinking that viruses may have played a key role in early the evolution of life, but that is another story. This story, the one on somatic recombination, is a very complicated one, so you can review the first two parts, here, and here. Note that I’m focusing on B cells, but the process is essentially the same in T Cells. Given negative light in which viruses are seen, it seems ironic then that the mechanism by which a retrovirus integrates its genetic material into the infected cell is very similar to the mechanism by which our B and T cells produce the molecules needed to recognize and defeat bacterial and viral infections 1. Two proteins, named RAG1 and RAG2, which start off the process in our cells, have been shown to form what is known as a transposase. In retroviruses such as the one which causes AIDS, a transposase is used to splice the viral genetic material into that of the infected cell. RAG1 & 2 combined in a human cell can do the exact same thing2. Even the genes which encode these proteins are extraordinary. Mammalian genes usually contain regions called introns which are non-coding and though transcribed, are edited out before the RNA is translated into a protein. However, the RAG genes, like most bacterial genes, contain none. This seems to me, at least, to be a very interesting evolutionary story. How did genes that don’t contain introns and code for proteins which form a transposase end up in our genome? I’ll have to note this question for another post. 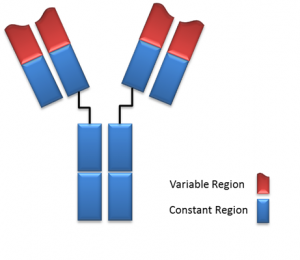 As I mentioned in my last post, the immunoglobulins that Recombination creates have a both a variable (V) regions and a constant (C) regions. They are made up of two identical pairs of protein strands, called chains, with each pair consisting of one light and one heavy (the heavy chains are the longer chains in the image to the right). It is the variable regions we are concerned with here and RAG 1 & 2 proteins join, and then incorporate a few other proteins to form what is known as VDJ recombinase to produce them. The recombinase is the lead actor in somatic recombination. This is not the case, however, at the loci which encode the heavy and light chains of an Immunoglobulin. An examination of the light chain locus on chromosome 2 will reveal not a single gene but rather a large number of gene segments. Further, there are special sequences of nucleotides to be found surrounding those segments. First, up are the so-called Leader sequences which come into play after translation and mark an immunoglobulin for transport to the plasma membrane. Second are the even more interesting Recombination Signaling Sequences (RSSs) which are the markers to which the RAG 1 and RAG 2 complex binds. As depicted in the diagram below, there are actually different types of gene segments within the locus which will be combined together in the process. 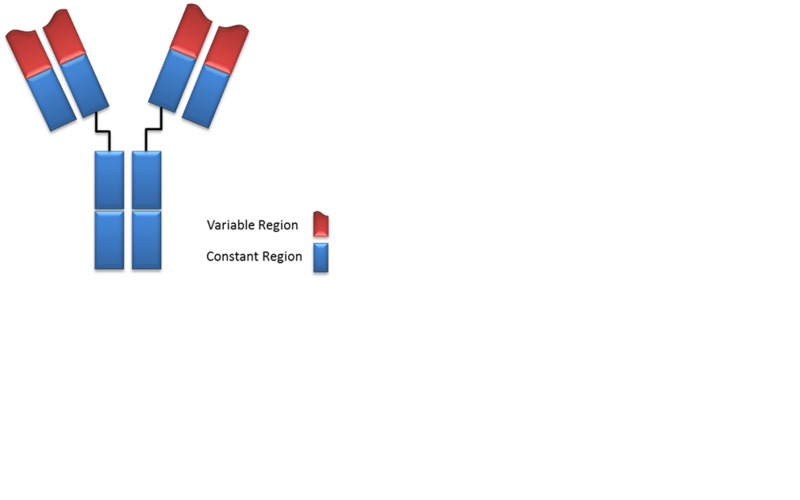 The variable region generated by the VDJ recombinase will include one each of the V, D (heavy chain loci only), and J segments. The C segments code the constant regions and we’ve only found a handful so far. Estimates that I’ve read or heard for the number of V segments, on the other hand, range anywhere from forty to hundreds within a given locus. 2. Nature. 1998 Aug 20;394(6695):744-51. Transposition mediated by RAG1 and RAG2 and its implications for the evolution of the immune system. Agrawal A, Eastman QM, Schatz DG. Department of Pharmacology, Yale University School of Medicine, New Haven, Connecticut 06510, USA.